My favorite thing to do in life? Is to go where I have NEVER been! I told our daughters when I came up to Indianapolis…take me where I have NEVER been. You should see the look on their faces when I announce this to them. On most of my visits, we are zooming around downtown to an event, but we never stop to smell the roses at the beauty around us. Today, we took the time to visit the American Legion Mall Park right in the middle of downtown and the surrounding area…above you are looking at the outside of the Indianapolis Library. Now, how did “Little Man” get in this post? Smile…you knew this was going to happen, right?! A great way to end our little story at the park, walking home under the canopy of trees. Printing smaller photos or for the web…cut the amount in half to 50 and radius>1.7. Of course, you need to do what is pleasing for your eye, but at least this gives you a beginning where to start. Is it important to YOU to go where you have never been? It’s like a magical adventure! Magnificent post for the letter “M”. Great pictures – I love how you frame them! I am like you – I love to go to new places!! I want to say, “they don’t build them, like they used to” but it’s so cliche. I’m an admirer of traditional architecture and find it hard to see the beauty in contemporary construction. But then you’d probably guess that given my love of vintage. The tree’d walkway is gorgeous. 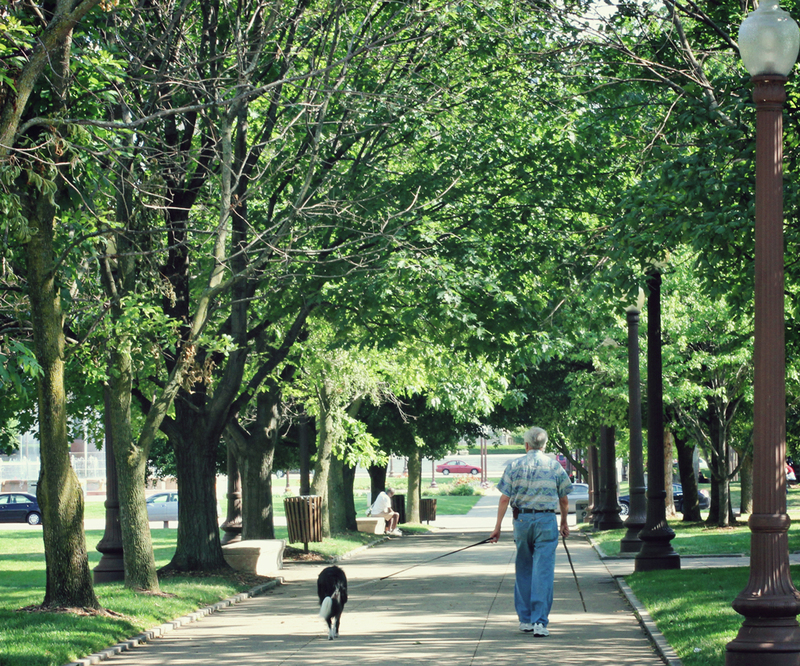 Here, developers of new area’s aren’t making planted boulevards anymore, it’s a real shame. Love all the lush greenery around! Looks like a beautiful place to visit! 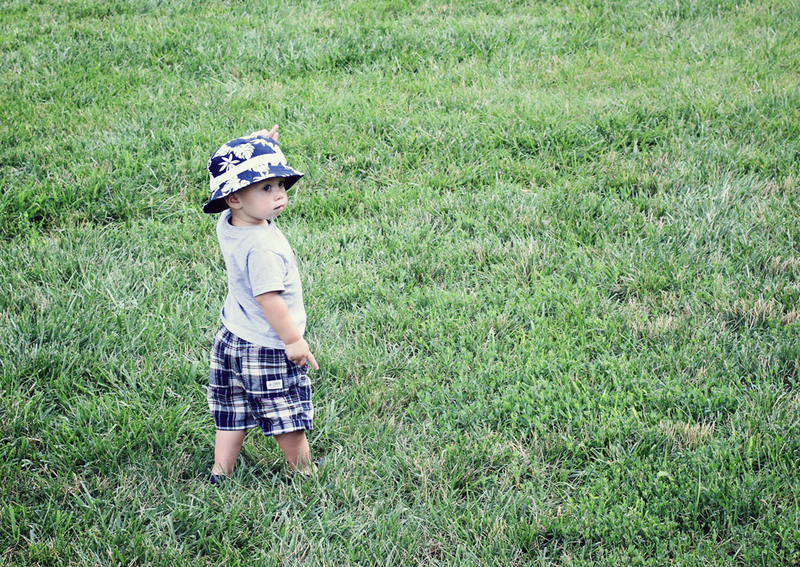 Beautiful photos and such a handsome little man!!! Adorable! Thank you so much for your lovely visit to my place and kind comment. I love to explore new places! The little man is a sweetie! 🙂 I’m still smiling to see “little man” he’s such a cutie! Thank you for the PS tips. I have been drooling over PS lately. Trying to learn it with the free 30 trial and then thinking – should I get it?? You always the the option of Photoshop Elements 11, which does a VERY nice job at half the cost. What??? I have never heard of Photoshop Elements 11 – Thank you I’ll check it out! Yes! I’m a member of Costco. What a lovely green place. I love cities where you have both urban and green areas. Kudos to your kids finding a new location! Oh yes — the joy of discovery. And seeing things with the eyes of a child. Great stuff! What a wonderful series of shots! My Mom used to take us on day trips around Cedar Rapids, Iowa, just for fun. We saw the “Little Brown Church in the Vale” from the hymn by that name and a great watch factory, as well as the Bre’r Rabbit Molasses and Quaker Oats factories in town. 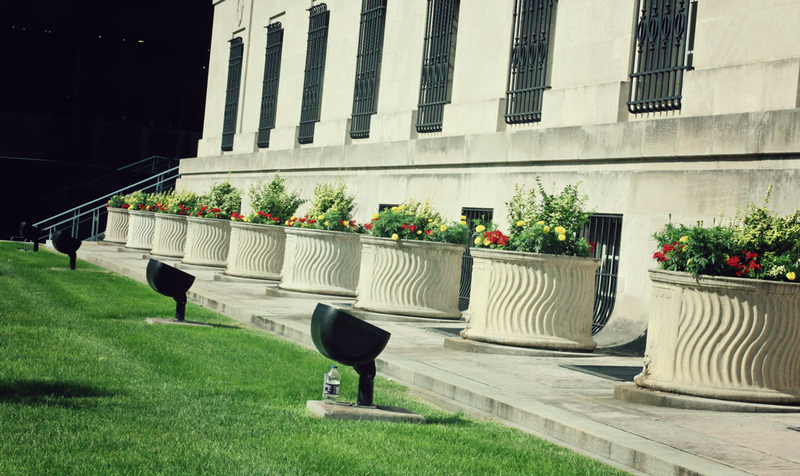 Love those library planters — so massive! It’s amazing that some people still continue to litter…. I bet Little Man doesn’t litter! He’s such a cutie pie! Great pics! It’s amazing how people just continue to litter… I bet Little Man doesn’t litter! He’s a cutie pie! Love those planters at the library too! Absolutely. I love to go where I’ve never been — both in reality and in my mind…New places, new people, new ideas, new insights all keep you learning and growing — and that’s what keeps us young. Great post, Laurie. Sherry, I think that is why blogging is very addicting to a lot of us. It takes us where we might not have been…how exciting is that?! Always love when you visit my friend. I love big libraries like this! There are a few in my little city – the main branch is huge and monumental, the other one new and modern – such a fun contrast! I love to go where I have never been before which is one of the reasons I like to visit your blog. What a beautiful library. I do love to go to places I have never been…the thrill of finding new places is right up my alley. Looks like Little Man enjoys this too!! The photos look great and what a fun place to visit. The funny thing is that “I’ve been there before!” My husband and I lived in Indianapolis for a couple of years when our children were small, and we took my in-laws to the American Legion Park when they were visiting from Maryland. Your pictures capture the beauty of the space, it was so nice to revisit! Elisa, I am so glad you enjoyed it the second time around. I too get very excited when someone shows a post of an area I have visited in the past…brings all the memories back. This looks like a perfect place so take some time to smell the roses. I love visiting new places, but I am very much a homebody. There are always places that you have never seen before, and it’s such a wonderful feeling when you locate them mostly right under your nose. Little man looking adorable as usual. Yes definitely. It’s why I travel, to see places I’ve never seen and meet people who dress, eat and do other things different from me. Wonderful tip! I like you love to travel and there are so many places yet to see! It never ends! Never tire of exploring the unknown. Like to come back home though. Yes, I do like to go to new places – however, even when I return to places that i have been, I am never the same person – the surrounding are never the same and I can always find something new to shoot that I may have missed in a previous visit. Beautiful response to my post…thank you. My thoughts were inspired by Georgia O’Keeffe’s door series of painting – we and the world around us change from moment to moment – nothing is ever quite the same. 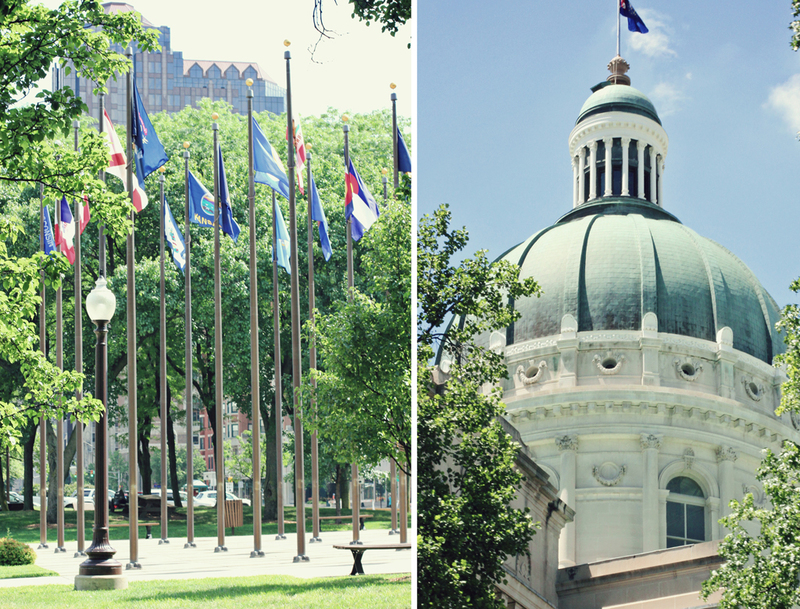 Indianapolis is a fun place to visit–there is so much to see & do! I love visiting new places as well–thanks for taking “us” along with you! I’m amazed at how bright and clear these photos are! Yep! Go to where you’ve boldly not been before 🙂 Works for me! Beautiful post, Laurie. And definitely lovely images. Your little man is really so adorable! He can show up on your images anytime! Excellent tip on the sharpening of images, I often use High Pass to do my sharpening in Photoshop. Works really well too. Barbarian?! Oh my word…you can always make me laugh! But it is sickening how people will leave their trash. I can see why you like to go to places you haven’t been to before. You came back with some very nice pictures. I certainly know myself how inspiring it can be to visit new places. Even better when you can do it in your own backyard so to speak. What a beautiful place to visit. I would spend quite a bit of time in the gardens. I love your travel and adventure spirit Laurie. Absolutely… I want to see everything I can. Even small adventures are memorable. That is funny that you told your daughters to take you where you have not been before. It seems that makes your daughter worried. 🙂 I think you are right sometimes beauty is closer than you think.